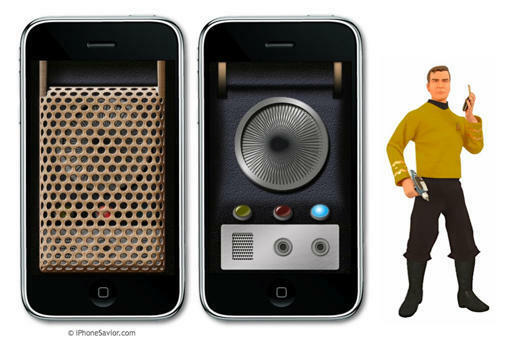 If you haven’t seen the latest Star Trek movie yet, or if you’re interested in rocking a genuine Trek look on your iPhone or iPod Touch anyhow, you will seriously want to consider picking up Talkndog’s super-cool 99¢ Star Radio Communicator (App Store link) app. Its trillium mesh cover flips out and animates open with a flick of the wrist, exposing the communicator interface. The opening action is accompanied by the familiar “chirping” sound known to old-school Trekkies the world over. Under the mesh antenna “cover” you get a hypnotic spinning black-and-white spiral, with three blinking colored lights and two metal buttons below. One button actually loads a working retro-modern iPhone dialer, complete with sounds that will make you think you’re punching in a star date.